We all – each one of us – are walking on our individual journeys through life – dealing with our questions either by ourselves – or with others. Sometimes it is difficult to deal with our questions. Sometimes our questions are difficult. In last Sunday’s Gospel we heard about the disciples – including “doubting Thomas” – locked up in the Upper Room out of fear – and then Jesus appeared among them. In today’s Gospel account we hear about two other “downcast” disciples – dejectedly walking – journeying – from Jerusalem to a nearby hamlet called Emmaus – and then Jesus appeared among them. The thing that is curious to me – is that in today’s account – the important point revolves around RECOGNIZING Jesus. Today we find this group of disciples – at first FAILING to recognize Jesus. Why did they at first think that this person – with whom they had once been so close and traveled before – was a STRANGER? What seems to be happening here deals with the question of HOW we see people. Obviously – we’re not talking here – about simply seeing with our eyes. We’re talking, rather, about seeing – with our hearts. We’re dealing with seeing… at much deeper levels of knowing and understanding. This is something we all know about, isn’t it? For instance – recall how you saw and understood your parents when you were a child. Then think about how you saw your parents when you were a teenager. The way you saw them changed, though…didn’t it? Now think about how you – as an adult – see and know and understand your parents. Again – it’s hugely different, isn’t it? Did they change – or did you change? I think we ALL know – it is we who changed – not our parents. Their love, care, and concern for us remained constant. It was our acceptance of their love, care, and concern – that went through different stages. It was the way we saw them that changed. And maybe the way we see them even now – is still changing. Isn’t that likewise true with others whom you love? Isn’t it true with your friends? Huge events have a big impact on the way we see – know – and understand other people. Back in 1941 a number of people had some very strong views about President Franklin Delano Roosevelt – views that were quite negative. Yet on December 8, 1941 – the day after the bombing of Pearl Harbor – these people saw him quite differently – to say the least. Huge events cause changes in the way we see events. They change the way we see people. Husbands see their wives quite differently after their first child is born – and wives – likewise – see their husbands in new ways. The disciples – walking on the road to Emmaus – were talking about all of the HUGE events that had occurred surrounding the crucifixion and death of Jesus. They were terribly upset because they had thought this Jesus the Nazarene – was, as the Gospel tells us, the one who would “redeem Israel” – the Messiah that God had sent – their Savior – and look what had happened! He was dead gone from them. They were dazed and bewildered by it all. They were trying to make sense out of it all. “Where was God in all of this”, they must have wondered? But then the Gospel account takes us to the one thing that opened their eyes – the event that allowed them to make all of the connections – the central piece in the puzzle. It was the breaking of the bread. The critical thing that occurred – was when the “stranger” who was among them – took bread – said the blessing – broke it and gave it to them to eat. Suddenly their eyes of recognition were opened. But they no longer saw Him with just their eyes – but NOW recognized him with their hearts. They saw Him with a RE-awakened faith. They recognized him because they encountered Him – in a totally different light. They saw him now – in that event – where He promised to be with them – always. Knowledge – you see – isn’t based simply on the acquisition of facts, information and data. TRUE knowledge – is seeing things based on wisdom and understanding. True knowledge of your FAITH – is seeing reality using the gifts of the Holy Spirit – in particular His gifts of wisdom – understanding – and knowledge. Jesus comes to you and me in ways we least expect. Why is it that all of the saints and seers – who are a part of our Catholic Faith – speak of God’s coming to us in moments of surprise? We know that to be true, don’t we? We know of our own moments of surprise – our own moments of wonder – when suddenly we are aware of God’s presence to us – when – out of the blue – we hear what He’s saying to us. This is why we need times of reflection. This is why we need to take the time – to get out of the busy-ness of our days. We need to turn off all of the noise that’s hurled at us in this modern world of ours. For it is in THESE moments of quiet reflection – when we’re out for a stroll – or when we’re in some quiet place – where we’re allowed to reflect – that we begin to “see” Jesus – with our hearts – and come into a deeper awareness of His presence to us. To deny that He is – in fact – present to us – is to deny the testimony of countless numbers of people – who down through 2,000+ years of Christian history – tell us of their “walks to Emmaus” – tell us of their moments of coming to recognize Jesus – and their encounters with Him. 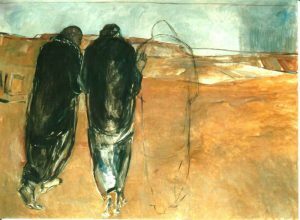 May we ALL take some time – to take our own walk to Emmaus. And may we ALL come to recognize Him – not only in the breaking of the bread – but in all those other moments – those moments where God tries to break in on our time – and walk with us as we face all of the stupendous events – that life hurls at us. For without His presence with us – we certainly WILL feel depressed and defeated. Without His presence – we will not be journeying to a destination – we will simply be wandering – alone.